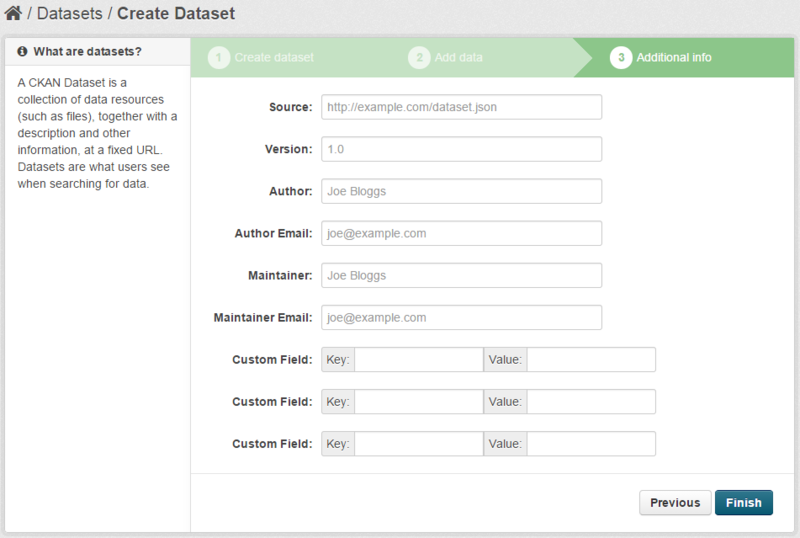 CKAN allows you to publish your own datasets in order to make them accessible to other users of the platform. 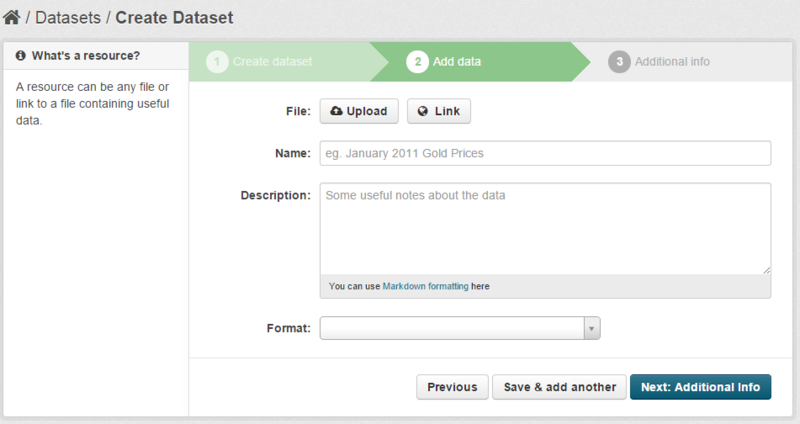 In particular, you can upload your datasets as files directly into CKAN, or you can provide a link to the data. This section explains the process that have to be carried out in order to publish a dataset in CKAN. To publish your own datasets (open data) in CKAN, you have to access the FIWARE Data portal and sign in with a valid FIWARE Account (see the section Create your identity in FIWARE. 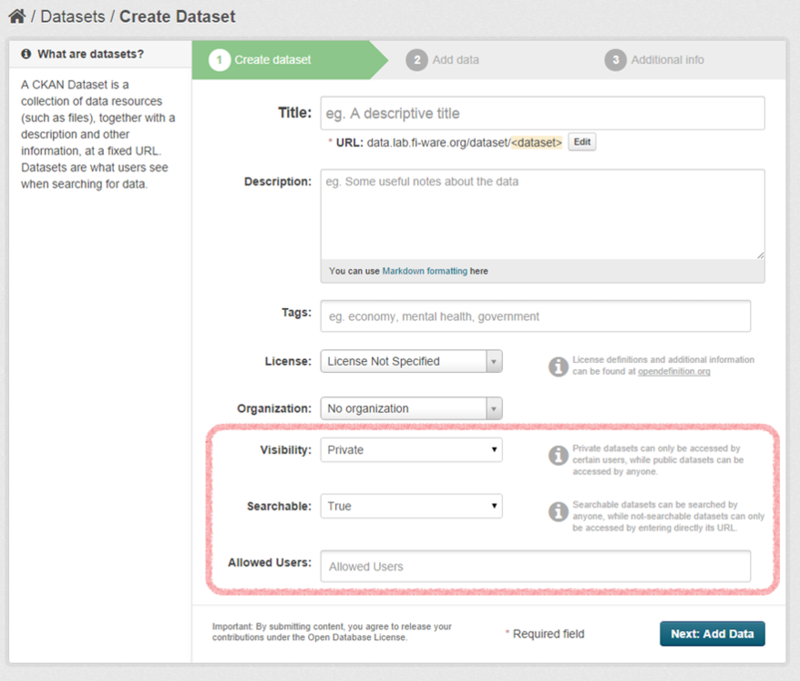 Once you have signed in, go to the “Datasets” section and click on the “Add Dataset” button. Visibility: if you choose “Public”, all the users (even those that are not logged in) will be able to access the dataset. Otherwise, only some selected users will be able to access the dataset. Searchable: you can choose if you want your dataset to be displayed in the queries performed by the FIWARE Data portal users. This field is only enabled when “Visibility” is set to “Private”. If you create a public dataset, it will be always searchable. Allowed Users: the list of users that can access your dataset. In the second step you have to provide the data itself. To do that, you can provide a link or upload a file with the data. Any type of file is allowed, but if you want to generate an automatic API to access your data, you must upload a CSV file. NOTE: Take into account that “Private” resources created using the link option must be secured using the appropriate mechanism (e.g. by following the [Handling authorization and access control to APIs] tutorial). CKAN will only control the access using the CKAN interface, but direct access to the linked resource must be controlled on the resource itself. 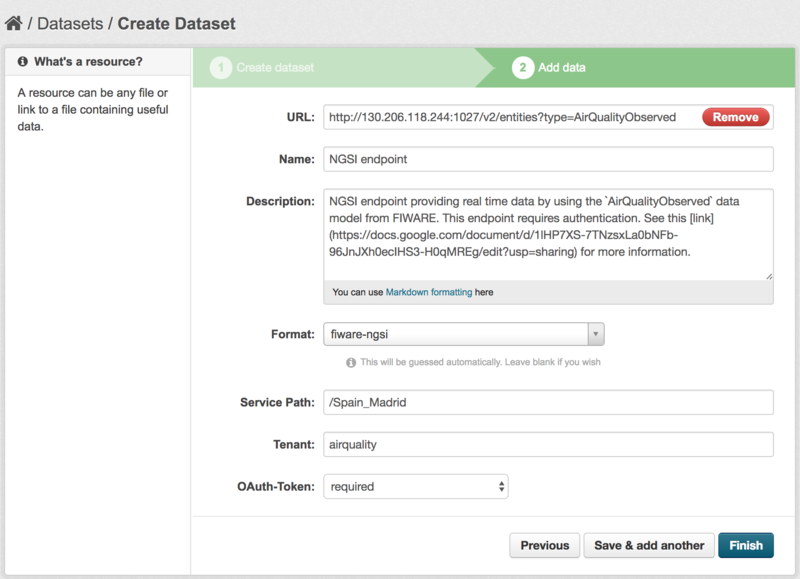 You can also provide dynamic context information by providing a context broker URL and selecting the fiware-ngsi format. Once selected the fiware-ngsi format, three extra fields will appear allowing you to configure the tenant and the service path to use for accesing the context broker (you can leave them empty if the data is stored in the default tenant or service path). The last field allows you to indicate whether the context broker requires authentication (see the [Handling authorization and access control to APIs] tutorial for more details). NOTE: fiware-ngsi resources are always linked resources, so if the dataset is private, the fiware-ngsi must require an auth token for coherence. In the last step you can provide some metadata (Author, version, maintainer, etc). Nevertheless, this metadata is not a must, so you can skip this section if you want.